What was I thinking when I added a border to the back of the quilt which echoed the front? Oh yeah, I WASN’T (thinking)!! I love the back but I opened a whole can of worms on myself. Why you ask? Well, I created a row of chevrons on the back of the quilt which echo a row of chevrons on the front. I also added those lovely crisp, white boders on the top and botton of the quilt back which also match up with the front. This creates a problem when free motion quilting because unless the front and back are lined up perfectly, the free motion quilting wouldn’t look right on the back of the quilt. Earlier today I based the front to the back and began to stitch up one of the chevron that line up with one of the front chevrons using my walking foot but quickly realized half way up one seam that it was off so I took out the sewing and HAND STITCHED up the chevrons to make sure they matched the front. Then I hand stitched the top and bottom borders to make sure the front and back matched. FYI, my hand stitches are small, not microscopic but small enough that I went through FOUR movies while I completed this task. After all that stitching I pin basted and am ready to start free motion quilting tomorrow. I find it really exciting when a quilt top starts to become a quilt, I love this design and can’t wait to see it all finished. What a labour of love! I’m sorry if there are any typos or grammatical errors in this post, I’m exhausted! This entry was posted in FMQ, Quilting and tagged Bonnie & Camille, In Reverse Quilt, Marmalade Fabric, Vintage Modern by Tabatha. Bookmark the permalink. 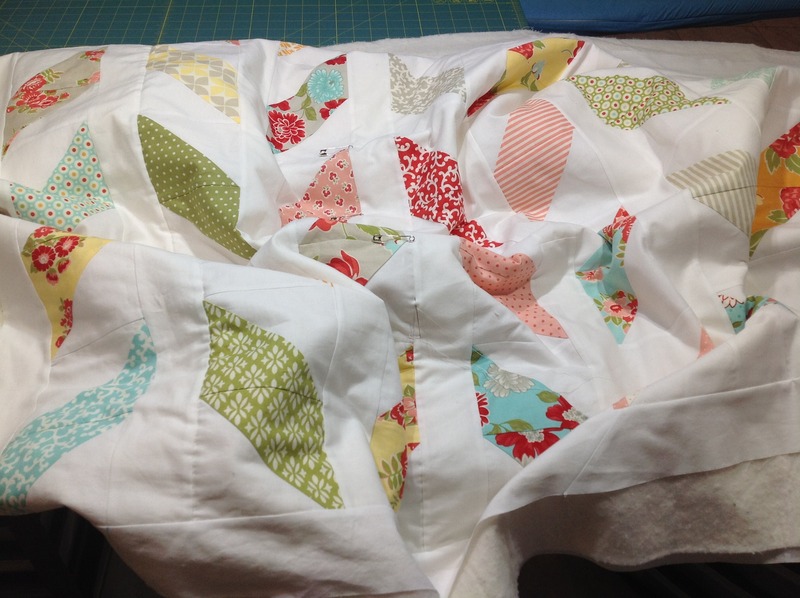 I love this quilt Tabitha! The back is as pretty as the front! I hear you on lining up the front and the back… That is a real labor of love! Can’t wait to see how you quilt it! Thanks Lori, one day I’ll grab some fabric from Ikea so I won’t have to piece a back together! 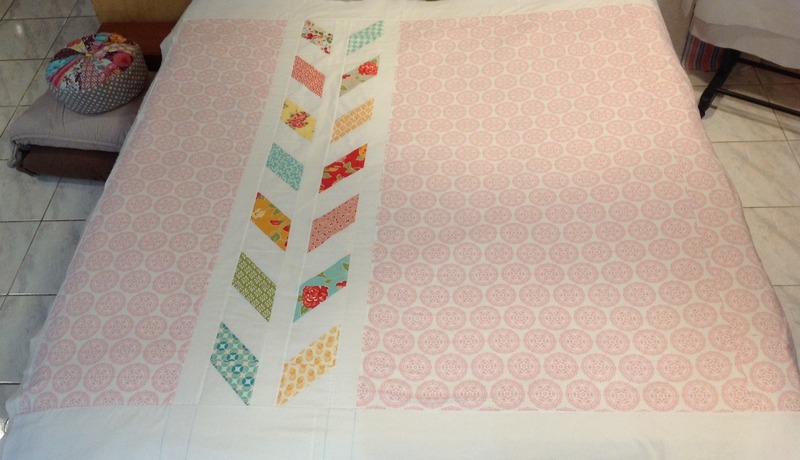 ;D I think I’d like to quilt swirls up the long white strips and leaves in wedge spaces, can’t wait to get started! This is so pretty! I can’t wait to see it all finished. Don’t wear yourself out please…. Awe, thanks Pamela! Hopefully I’ll be able to get the quilting and binding done by Monday. Great solution to how to match the front and back up properly. I’ll have to remember that. I’ll look forward to seeing the finished quilt! It looks so great – that pieced section on the back! I’m so glad you took the time to hand-stitch it all together – you’ll be sooooo glad you did everytime you look at or use this quilt! I have never gotten the hang of machine-quilting so do all my quilting by hand. It’s slow, but also relaxing and satisfying! I agree – getting close to the finish line with a project is a thrill!! !